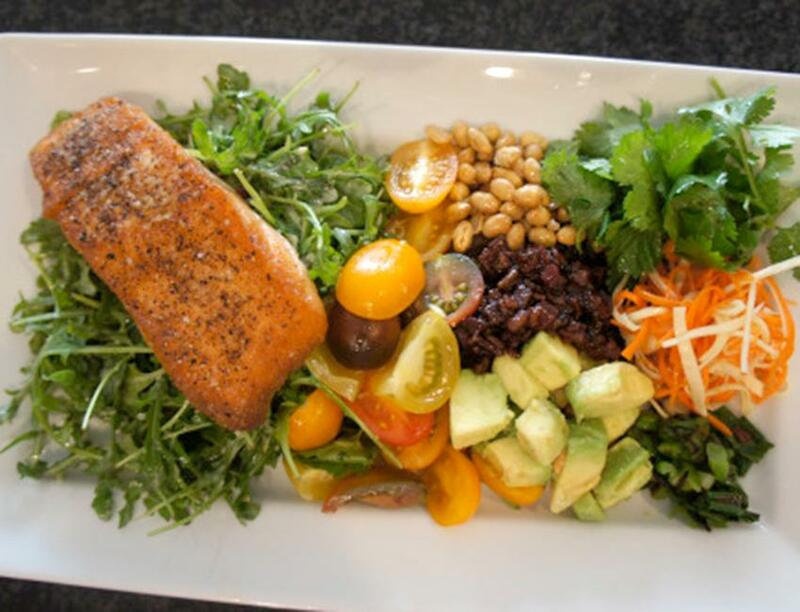 A delicious twist on the cobb salad from Chef Austin Yancey. Features seared salmon, soy ponzu glazed bacon, pickled radish and carrot, fresh avocado and creamy dressing. Toss fresh seasonal greens with dressing, and add to serving bowl. In a large bowl, toss each of the ingredients separately with dressing and place on top of salad, arranging each one artfully. Heat vinegar and sugar until simmering, remove from heat. Add carrot and daikon, allow to pickle for 3-4 minutes, reserve. Cook bacon until fat is rendered and bacon is brown and crispy, strain fat. Add soy ponzu and reduce until syrup-like consistency and bacon is completely coated. Reserve for salad. Add egg yolk, mustard, garlic, ginger and vinegar to blender. Blend on medium speed for 30 seconds. Drizzle in sesame oil and vegetable oil. Add cilantro stems and season with salt and pepper.